As you may have noticed, I’m sort of an enthusiastic person. 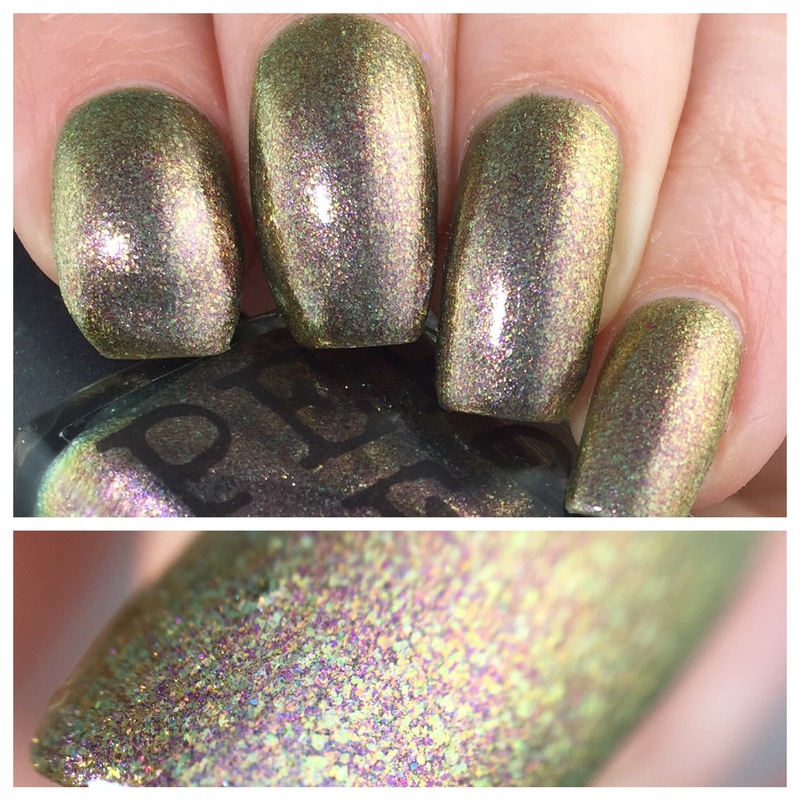 So here on the blog, I’m often talking about “oh, I love this” or “this is so fantastic!” For the record, I’m not blowing smoke, just passing along my genuine enthusiasm for crazy unique nail polish, fun themes, and random other bits and bobs. 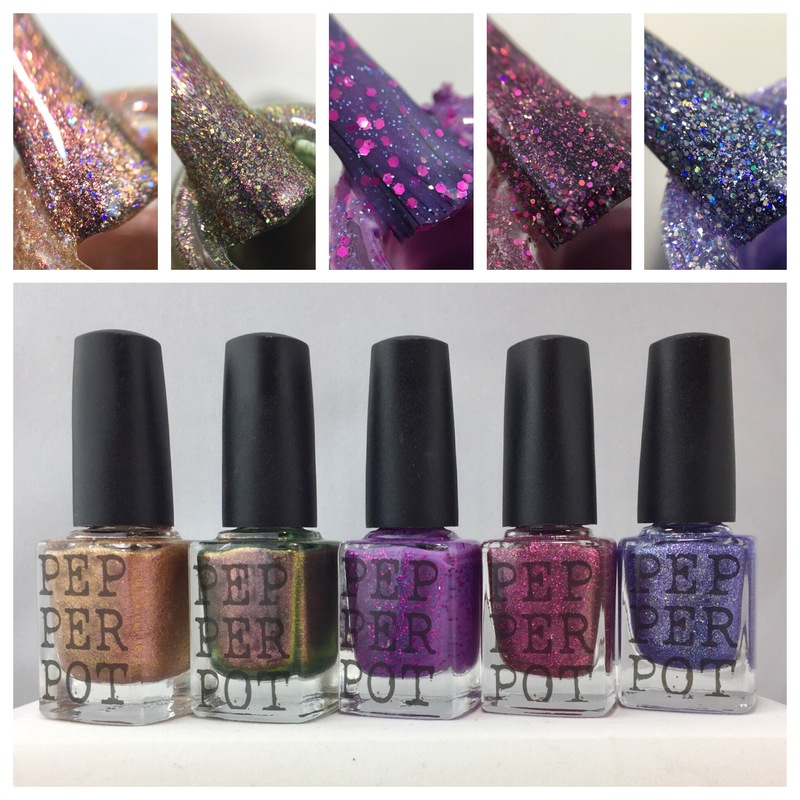 So when I say that this new collection from Pepper Pot Polish combines some of my favorite things…I ain’t lyin’. This has a gold/orange/red shifty base with subtle lavender and purple shimmer. This was the sheerest of the bunch for me. I used three coats to get full opacity. Then I promptly sat around and stared at it for a while. The nearly metallic shininess of this shade, combined with the shift and the contrasting shimmer is very entrancing in person. This has a taupey/olive greeny shifty base with gold/green/pink flakies to add to the sparkle. Like “Cats & Feminism 4Ever,” this has a super cool, almost metallic vibe. The formula and look f this might make it my favorite in a collection with some seriously stiff competition. It’s just so smooth and easy to use- I used three thin coats here, but two would have cut it. A must for love green lovers (aka me). 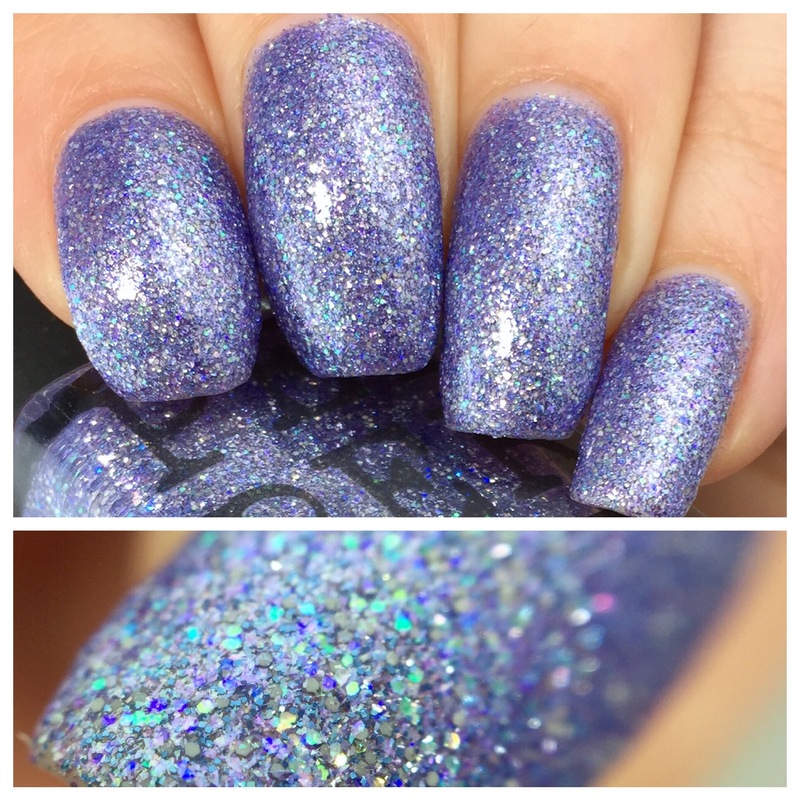 This fun shade has a violet base with magenta hex glitter and blue microglitter. I have nothing like this in my collection. Also, I wish every glitter were this nice and forgiving for me. It was nearly smooth without any topcoat (though these swatches show two coats of “Revolution!” with one layer of topcoat). If you follow my Instagram, you’ll know that this shade made me think of a city at dusk (purple light glinting off the buildings, stars just starting to come out). 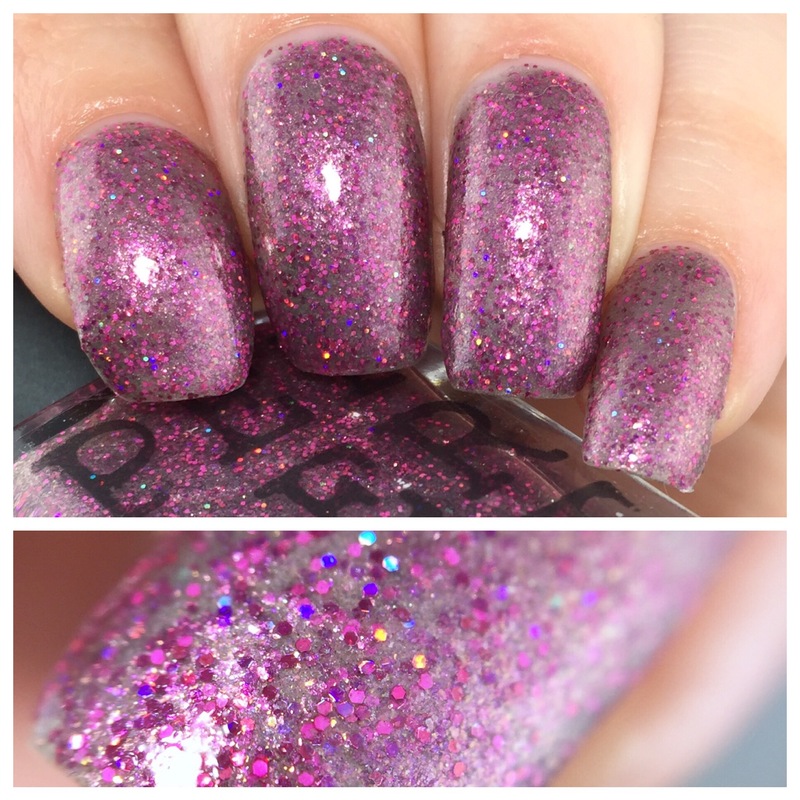 Magenta holo glitter and hot pink microglitter are the focal point of this sparkly, sparkly polish. To me, this shade feels very unique- I love the combo of the silvery gunmetal base with the loud pink glitter. Because of the glitter, this one is a bit textured, so I’d use topcoat with it. Two coats here. Ok, this one might be my favorite? It’s a glitter bomb with lavender, green/gold, periwinkle, and gray mircoglitter and it is stunning. The green/gold glitters are mindbogglingly gorgeous. This shade is last because I put it on and I couldn’t take it off for days. I couldn’t bear to cover it u with any nail art. I had a little moment of nail polish love in my heart with this one. Wear it on days when you want to smash the patriarchy. You want them? Yeahhhh, you want them. Believe me. 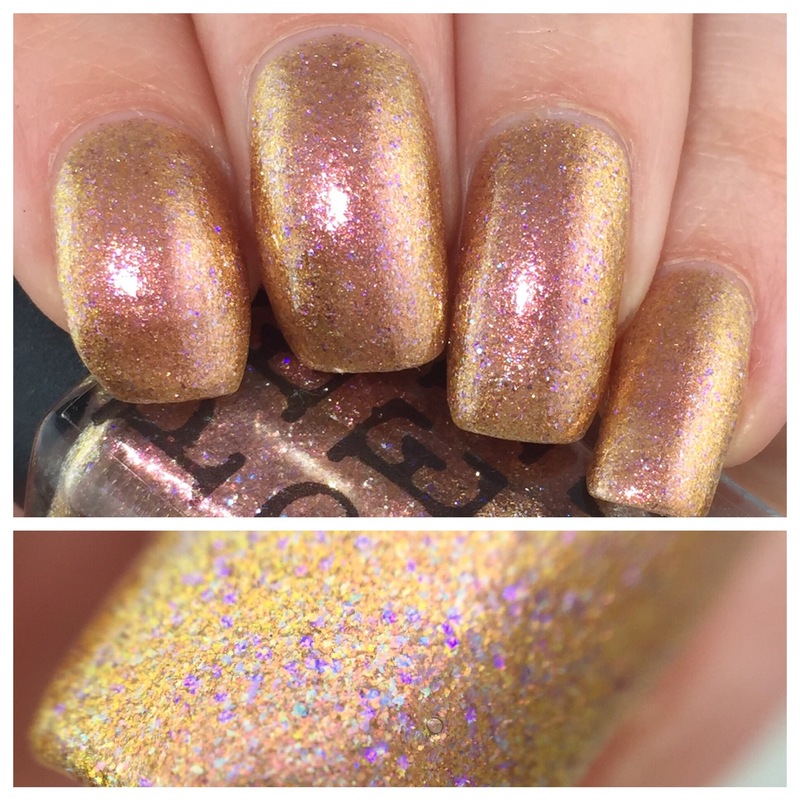 The thing I love most about Pepper Pot Polish’s shades are how delightful her formulas are. I think it’s a density thing- they’re never too thick or too runny. This whole collection has my (admittedly silly) seal of approval. You can pick them up on Pepper Pot Polish’s Etsy site today, February 1st! You can pick the whole collection up for $45, or $10 for each shade. PLUS!!! You can get 15% off with this code: PHD2017 (no minimum). Or you can use FREESHIP30 for shipping off an order of $30+. Many thanks to Pepper Pot Polish for sharing these codes with me! Bless this hot mess is my favorite!